Visit the showcase site for Earth: Portrait of a Planet. Photographs combined with geologic sketches guide students step-by-step through geologic processes and help them make connections between what they see and the science behind what they see. 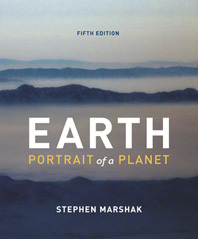 Much of the text’s art, photographs, and short captions have been revised for this edition and the animation program—created with Professor Marshak’s expert supervision—has been updated for consistency and features a new detailed 3D appearance. All digital elevation maps have been greatly improved and new or heavily revised figures appear in every chapter. A new real-world video collection showing geology in action is also available to stream, with links that can be embedded in your online classes. SmartWork makes it easy for instructors to get started with a range of highly visual question types, including labeling, drag and drop, ranking, as well as 50+ interactive “What a Geologist Sees” activities. Sample sites are available through Google Earth™ for professors to use in class. A complete workbook—available as a standalone text or as a bundle option—is available for professors to prepare out-of-class assignments. The Fifth Edition explores many of the issues making today’s headlines, from major changes in the energy landscape, especially those driven by fracking and increased use of natural gas, to the findings of the latest Intergovernmental Panel on Climate Change. New geophysics research and data from Earthscope contributes to a discussion of the structure and evolution of the North American continent and the processes controlling earthquakes and volcanoes. Every chapter in the Fifth Edition opens with objectives that guide the learning goals of that chapter and complement the take-home messages at the end of each section. Key concepts are highlighted for easy identification, and an additional “Quick Question” further challenges student understanding. “Did You Ever Wonder” questions throughout each chapter engage students with simple questions from everyday life. “See For Yourself” features point students to sample sites in Google Earth™ and, in the eBook, this feature can “fly” a student to that location directly, via Google, for further exploration. Prelude: And Just What Is Geology? Chapter 12: Deep Time: How Old Is Old?